Steven (Chicagoland, United States) on 13 September 2013 in Architecture and Portfolio. Another edition of "What's old is new again!" 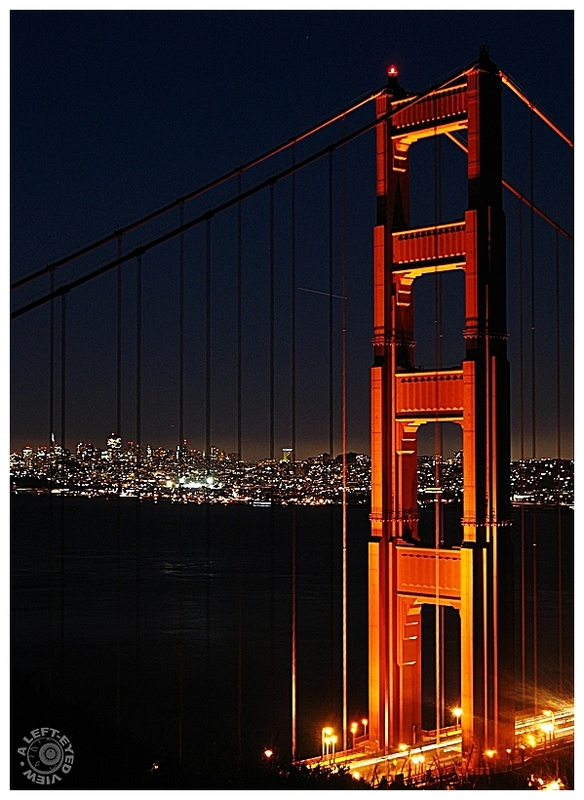 (Tag: woina) A nighttime shot of the Golden Gate Bridge captured on April 15, 2008 in San Francisco, California. There are some people who say it's good to see how far you have come along since the early days of Aminus3 when my quality was far below par. Here was the original photo that I posted. AACCKK!! I'll be away for a while. See you all on Monday, October 14th! Amazing difference in sharpness and clarity between the two. Excellent shot. Very good work. To my mind, this version is better. Well done ! Whaoo! Very beautiful night shot! Marvelous place to visit. Again, such an amazing transformation . . I was reading to see if anyone had Commented "you must be able to do better than this, surely" back at the original . . but we didn't !! Magnificent framing and updated treatment - a unique image of this icon. beautiful shot with this light, colors are beautiful and exposition too. Great work with the composition and with these extremely difficult lights. Excellent balance achieved. 5 stars from me - spectacular!!! Hmm. Interesting that you link to the original to show us your growth. I like what you do, and how you present, and what you share in your blog, Steven. AM3 is great great "Blog" (Web-log) in showing how things have changed, some of the shots I started with , I now see as horrendous! The difference is totally amazing! This is just beautiful! A gorgeous image of the bridge and the city! I like the warm light on the bridge and the bright lights of the city in the background. Another gorgeous take on an iconic landmark. The close-up (relatively) on the single lighted tower provides a viewpoint I've never seen before. That is beautiful and absolutely impressive!! This is a fantastic shot!! Its sharpness is excellent!! wow, this version is spectacular compared with the original - although that was great in its own right! Quelle différence ! Magnifique transformation ! A superb transformation from the old to the new ! Beautiful colours and light ! Not posting as yet only commenting . Wow, what an amazing difference - I happen to remember when you posted the original image of this scene. You've really done this shot justice, Steven. Well done! The quality is really better, good job ! The lighting in this is awesome!! Well done!! ps - i love that view from the marin headlands. we lived and worked in san rafael before we retired. It is really nice with the city lights in the background.